My experience with ferns is somewhat limited, for two main reasons. The first is aesthetic: I tend to go for large, broad, more or less solid leaves (Dieffenbachia, Anthurium, Monstera, Aglaonema, Strelitzia) or else long, thick, strappy leaves (Dracaena, Yucca). There aren't a lot of small, delicate, fluffy-leaved plants in here. The other reason for my limited fern experience is cultural. Most of the available ferns get ruled out for one reason or another: Adiantums are divas, Nephrolepis are horrible slobs, people seem to have wildly different experiences with Platycerium and I'm not willing to risk a bad one yet, I can't decide whether I like Polypodium or not, and most of the rest are either unavailable or unknown to me. My main personal plant, at the moment. It's still a pretty recent acquisition. And it's not like I haven't tried the occasional ferns anyway, but so far we've discovered that Aspleniums (bird's-nest) don't do well for me,1 Cyrtomiums (holly) do well but are fairly coarse-looking, as ferns go (which may be one reason why I like them), and Davallias (rabbit's-foot) are the only other ones I've tried. And they do . . . okay, culturally, though they're not the easiest plant I've ever tried. And aesthetically, well, they don't have gigantic leaves, but the fronds actually look a lot like the generic "fern" picture that always gets trotted out when people talk about fractals.2 And that's kinda cool. As with Glinda, too, there's a slightly sinister angle to Davallia,5 which are the creeping rhizomes which produce the fronds. I have had customers decline to buy them because the rhizomes made them uneasy for some reason. I think the rhizomes look enough like little paws or whatever that some people have a moment where animal and plant seem to be mixing in unpleasant ways. A fern with paws, a dog with roots, a cactus with humanlike hair,6 whatever, it all looks like the mixing of categories that shouldn't be mixed. Close-up view of the rhizomes. Davallia bullata - Japan, China, and tropical Asia. Davallia canariensis - Canary Islands to Spain and north Africa. Davallia divaricata (syn. : Davallia polyantha) - Tropical Asia. Davallia fejeensis Hook (syn. : Davallia fijiensis) - Fiji Islands and Australia. Davallia solida - Malaysia, Polynesia, and Queensland. Davallia trichomanoides (syn. : Davallia dissecta) - Malaysia. Sharp-eyed, geographically aware readers will note a certain Pacificness to the group (except for canariensis), but that's about the only sweeping generalization to be made. Presumably the unlisted thirty-odd species fill in the gaps between the Canary Islands and the Pacific Ocean somehow. I am not a Davallia taxonomist, and do not actually know what species my own plants belong to. The best bet is probably fejeensis, which seems to be the one that gets mentioned the most when people bother to name a species, though trichomanoides and D. tyermanii also get mentioned quite a bit. 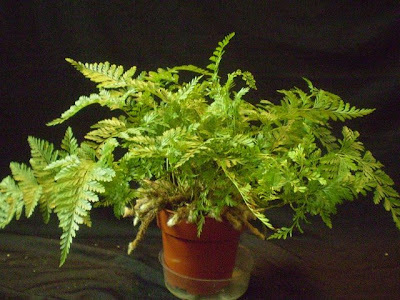 That said, there's apparently some rearrangement taking place in the world of fern taxonomy, because we had a batch of rabbits-foot ferns come in with tags identifying them as Humata tyermanii. Very few sites are using this name, so for the time being I'm still going to call them Davallia. Hanging basket at work. Hanging baskets are a little awkward, but they do allow one to show off the rhizomes better. LIGHT: Doesn't seem to be a huge issue, actually, though I wouldn't put one in a dim spot for long periods, or in full sun all day in a south window. My best results have been with either very bright artificial light (in the mini-greenhouse) or a few feet away from a south window, both of which fall into the bright indirect to filtered sun range. An east window would probably also work fine, though I haven't tried that because I don't have any. On-line sources mostly suggested filtered sun. 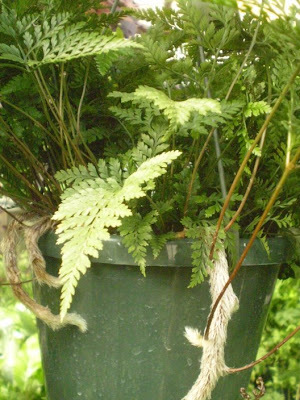 WATERING: These ferns are naturally epiphytes,7 or semi-epiphytes, so they are better adapted to take up water through the rhizomes than through the roots, and it's possible to overdo the watering. For this reason, you should relax about repotting your plants: it's probably not urgent to them. Aim for the pot to get about halfway dry between waterings, but slightly dryer than that in the winter and slightly wetter than that in the summer. You may mist lightly between waterings, as well. Overwatered plants' rhizomes will change color from silvery-gray to brown-black; this is often accompanied by a plague of fungus gnats. 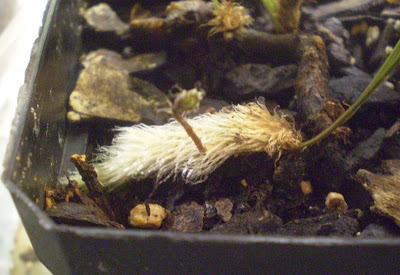 The dark black sticklike thing that begins at the right-hand side of the white rhizome in the picture and continues back and to the left is a Davallia rhizome, and is probably too wet, though so far it's managing to hang in there, so I'm hoping that it will recover. You can see a little tuft of whitish rhizome at the very back of the photo that is new growth. It might still work out okay. HUMIDITY: Somewhat of a big deal. 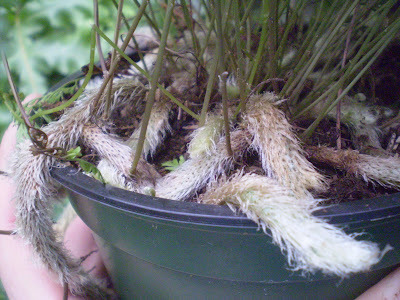 If humidity is too low, parts of the fronds (particularly the tips and edges) will brown and die. They don't really have unreasonably high requirements for humidity, as ferns go, but putting one on a central heating vent will give you a dead plant in short order. Misting is not necessarily useful for raising humidity:8 I recommend moving the plant to a humid room (bathrooms and kitchens are usually the most humid parts of most houses), using a room humidifier, or setting up a pebble tray. PESTS: I've only ever seen one thing on Davallia, and I think that was kind of a fluke -- I had springtails once. Or at least I'm pretty sure they were springtails. I don't know whether they were actually causing the plant problems or not. Otherwise, I haven't seen anything serious. As mentioned above, fungus gnats will often appear if a plant is being overwatered. Mealybugs and scale are not impossible. Top view of the pot of surviving cuttings. Doesn't look like much now, and probably won't anytime soon -- they're slow growers -- but this is much fuller than its looked at any point up to now. GROOMING: Rabbit's-foots11 aren't as messy as Bostons, but they do drop fronds on a pretty steady basis, particularly during the winter. It doesn't look all that bad, but if you're the type of plant owner who likes to have everything dead cleaned up at all times, Davallia is not the fern for you. I should also mention here that it is not a good idea to cover the rhizomes with soil, as they will rot: this makes repotting kind of tricky, as you can imagine. FEEDING: I didn't see a lot of information about feeding, but the few people who did say something said that it's best to have a light touch. This makes sense, as epiphytic plants usually don't demand a lot of food. Also, I would assume (though nobody said this) that you can stop altogether between October and February. So feed lightly and/or infrequently, and skip winters. Table at work; we just got a bunch of these in, and the mass of foliage was striking. It's hard to sum these up very well. They're not the easiest ferns, they're not the hardest, they're not the neatest or the messiest or the anythingiest. But they're at least doable, and the fronds are attractive. I like them, but I don't recommend them to customers who are looking for ferns as much as I used to, because one, I recognize that they're not the easiest ones out there, and two, mostly what I find the customers want me to tell them is that they can keep a Nephrolepis going: for a lot of people, Bostons are the only ferns that really matter. Which is sort of too bad. 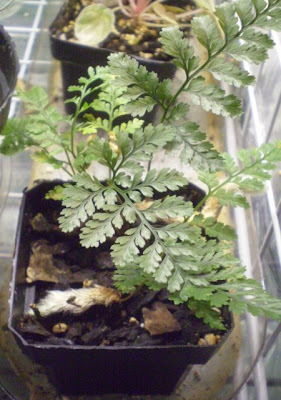 UPDATE: Also see the related unfinished business post, in which I figure out the difference between D. tyermanii and D. trichomanoides. Photo credits: All photos are my own, except for Glinda, which is from shawnnacox.com. 1 Or, rather: they do fine for about six to nine months and then suddenly and catastropically begin to fall apart. This has happened twice now, and I'm thinking I'm not going to try a third time. I can't pick from the many possible explanations which one I think is responsible, but bad soil (why must ferns always be planted in peat moss?) and occasional missed waterings are fairly likely. 2 Remember fractals? The 1990s were so 60s sometimes. 3 Not meaning "witches" as commonly understood at the moment; I mean "witches" as defined within the movie and as they would have been understood in 1939. I have some issues with Wicca and its practitioners, but these are irrelevant in the context of the movie. If there are Wiccans or Wiccan sympathizers in the audience who object to my use of the word "witches" in a negative fashion, I will meet you at least partway by agreeing that people who call themselves witches do not look or act like Margaret Hamilton's character in the movie, and are generally well-meaning people who are no less moral than the rest of us, and we should not burn them at stakes or become outraged if they speak to our children or etc. 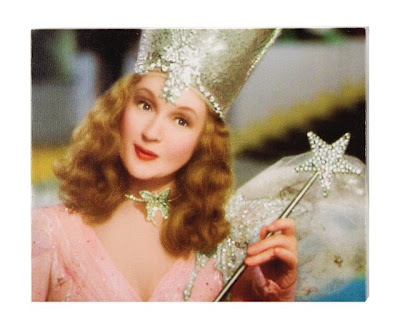 4 Also noteworthy: Billie Burke, who played Glinda in the movie, was apparently fifty-three at the time. This is kind of mind-blowing to me for two reasons: one, I wouldn't have guessed it from looking at her in the movie (though I suppose it would be hard to guess the age of anybody in that dress and makeup), and two, it's hard to imagine anybody that age being cast in that part, were the movie being made now. Of course, there are a lot of things about the movie that would never get past the test audiences, if it were being made now. 5 It always kind of bothered me that Glinda shows up at the end and is all like, oh yeah, I forgot to tell you, you could have gone home whenever you wanted, I didn't tell you 'cause you wouldn't have believed me. I mean, I get that it's supposed to be a dream, and dreams don't have to make sense, but it's also a movie, and I kind of like it if characters in my movies have understandable motivations for what they do. That's all. Of course, the ending is a little odd anyway: her big learning experience is that if it's not in her own back yard, she doesn't need to know about it? That . . . that's not a good lesson to be teaching people at all. 6 Which now that I've said all that about the Davallia-disliking people, I kind of wonder if this doesn't account for my own dislike of Cephalocereus senilis, the "old-man cactus," which otherwise seems pretty unobjectionable. 7 Like a surprisingly large number of other plants kept indoors, I'm realizing. Epiphyte, for those who don't know, is the word for plants which cling to branches of other plants, rather than anchoring themselves in soil. Many bromeliads (Aechmea fasciata and Tillandsia spp., e.g.) are epiphytes, as are some Anthurium species, Asplenium ferns, the bulk of orchids, etc. 8 This is kind of a controversial subject at Garden Web, and I assume also probably other places where people talk about houseplants. I personally think that while misting is probably better than nothing, it only increases the humidity for a few minutes at a time and is probably not worth doing unless you're willing to mist the clocks, carpet, books, bath towels, and everything else in your home as well. I'm not that big a fan of pebble trays, either, because I doubt that they can evaporate enough water quickly enough to make any real difference. Room humidifiers are really probably your best bet. Or you could, you know, put pans of water on every hot thing in your home (DVD player, radiator, dryer, TV set, oven). That might work too. 9 It's worth remembering that as the temperature goes up, the relative humidity goes down. This is basically meaningless for plants that are outside during the summer, but it's important to keep it in mind for indoor plants in the winter. If the plant is near a heat source (even an unintentional one, like a computer), the local relative humidity in that spot may be lower than it is in the room as a whole. This isn't to say that you should put your plant in a cold room so much as it's to say that humidity problems can actually be temperature problems, and vice-versa, and it's sometimes easier to change one than the other. 10 I have become convinced recently that vermiculite is the solution for all rooting-type problems. I have better luck with perlite for Ficus, but everything else so far (Begonia, Peperomia, Dieffenbachia, Pelargonium) does better in vermiculite. Though Peperomia caperata, at least, seems to do better in potting mix than in vermiculite or perlite either one. The biggest issue I've had with vermiculite is that it looks pretty much the same whether it's wet or dry, so sometimes I over- or under-wet it, which can cause problems, but soil is worse, so. Hi Mr. Sub, this is a plant that I love and have good results with although I am not currently growing it now in the the greenhouse. The thing I like most about it is the furry rhizomes. I think vermiculite is best also, but it is so light that is blows into the air with the slightest ease, like the spray wand on my coiled hose or even a sneeze by the gardener. Wasn't Billy Burke in the sitcom Dear John? Davallia is one of the few ferns that tempt me these days. It seems unfussy enough that I might actually succeed with it, and think the rhizomes are really cool. I'm one of those people who does well with Platycerium (as I mentioned on GW, I give it no special treatment whatsoever.) 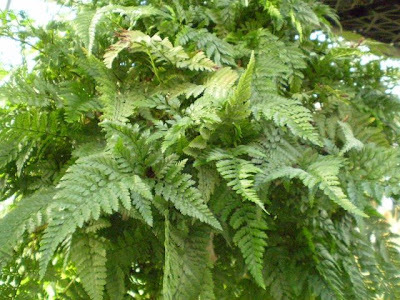 I've repeatedly failed with Nephrolepis, Aspleniums, and Pteris, though. Plants that are fussy about humidity or can't stand to be underwatered on occasion don't stand a chance with me. As an aside to Frances, the Billie Burke from the Wizard of Oz was born in 1884, so had she lived to appear in Dear John, she would have been over 100. You must be thinking of someone else. I find the best bet for plants that will not root in water on the window sill is a 50/50 vermiculite and perlite mix. the vermiculite holds water and the perlite help provides oxygen to the mix. The rhizomes on this kind of remind me of tarantula legs. Also with platyceriums, P. Bifurcatum seems pretty easy, but there are a lot that look really similar to it which are a lot more fragile, and I've heard that P. Superbum is supposed to be unusually difficult. dies back in winter but re-emerges in spring. Can take sun. 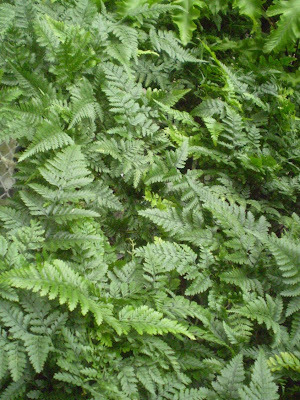 Autumn Fern - dryopteris erythrosora lives through winter. native to my area and winter hardy. Thanks for the really nice presentation. Music video: Beck "Hell Yes"
Work-related: Okay, who threw away the raccoon?